Arthur B. “Bull” Hancock, Jr. and William Woodward, Sr., two of the most important and respected individuals in American thoroughbred racing during the 20th century, have been elected to the National Museum of Racing’s Hall of Fame as the 2016 Pillars of the Turf selections. The Pillars of the Turf category is designated to honor individuals who have made extraordinary contributions to thoroughbred racing in a leadership or pioneering capacity at the highest national level. Candidates must be deemed to have represented the sport with indisputable standards of integrity and commitment through disciplines such as breeding and ownership, innovation, philanthropy, promotion and education. Hancock and Woodward join previous Pillars of the Turf selections August Belmont II (2013), Paul Mellon (2013), E.R. Bradley (2014), E.P. Taylor (2014), Alfred Vanderbilt II (2015) and John Hay Whitney (2015) in the Hall of Fame. Hancock and Woodward will be inducted into the Hall of Fame on Friday, Aug. 12 along with the racehorses Rachel Alexandra, Tom Ochiltree and Zenyatta; jockeys Ramon Dominguez and Wayne Wright; and trainer Steve Asmussen. The ceremony will be streamed live on the internet at www.racingmuseum.org from Fasig-Tipton at 10:30 a.m.
Hancock (1910-1972), who grew up on Claiborne Farm near Paris, Ky., graduated from Princeton University in 1933. He served in the Army Air Corps from 1941 through 1945 before taking over Claiborne when his father became ill in the late 1940s. Hancock then built upon an already grand foundation, expanding the farm from 2,100 acres to roughly 6,000, to make Claiborne arguably the most important thoroughbred farm in the world. For 15 consecutive years, from 1955 through 1969, Hancock stood America’s leading sire at Claiborne. Then in 1972, the year of Hancock’s death at the age of 62, Round Table reinstated the farm as home of the leading sire. The top stallions at Claiborne during Hancock’s era included Nasrullah, Princequillo and Bold Ruler. Hancock also acquired for stud other internationally influential horses such as Nijinsky II, Ambiorix, Damascus, Sir Ivor, Tom Rolfe and Forli. In an example of the farm’s consistent excellence under Hancock’s leadership, Claiborne raised at least one champion each year from 1952 through 1972, including five years when the farm raised as many as four divisional champions. Six of the divisional champions of 1957 were earlier foaled at Claiborne: Nadir, Bold Ruler, Bayou, Dedicate, Round Table and Neji. Hancock bred and raced the champions Moccasin, Nadir, Doubledogdare and Bayou. Thirty-two champions that raced for outside clients were foaled at Claiborne during Hancock’s era, including Hall of Fame members Kelso, Buckpasser, Nashua, Bold Ruler, Round Table, Riva Ridge and Cicada, as well as standouts Dedicate, Numbered Account, Bald Eagle, Ridan, Hoist the Flag and First Landing, among others. Hancock had a long-standing partnership arrangement with William Haggin Perry, whereby half of each Claiborne foal crop raced in Perry’s silks and half in Claiborne’s. Hancock also bred four European champions while at Claiborne, including Nureyev and l’Arc de Triomphe winner Ivanjica. 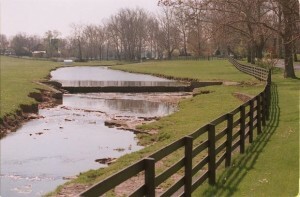 Claiborne was America’s top breeder in earnings in 1958, 1959, 1968 and 1969 under Hancock’s direction. Overall, Hancock bred 112 stakes winners in the Claiborne name, while also serving as an adviser to several prominent outside clients, including the Phipps family and William Woodward, Sr. Hancock had the distinction of being the first working horseman to be elected to The Jockey Club. He was also president of the American Thoroughbred Breeders Association and vice president of the American Thoroughbred Owners Association. Hancock was a key figure in the merger of those two organizations in 1961 into the present-day Thoroughbred Owners and Breeders Association (TOBA). In addition, Hancock was a director and trustee at Keeneland and a director of Churchill Downs, where he was one of the dozen who purchased controlling interest in the track to avoid a conglomerate takeover. He also was a member of the Kentucky Racing Commission, a director of the Grayson Foundation and a founding member and director of the Thoroughbred Breeders of Kentucky, in which role he played a part in establishing the American Horse Council.